Color plastic items with iodine! This experiment is included into "Diffusion" kit along with "Chemical reefs" and "Iodine fingerprint". Subscribe and get everything you need to do this experiments at home. Why should I use the black bottle? What if I used a blue bottle? The substances in the bottles with blue and black labels are identical – both bottles contain copper sulfate CuSO4. But we decided to use stickers to help differentiate between them because it’s possible to cross-contaminate the copper sulfate while doing the “Chemical reefs” experiment. It’s no problem if you used the blue bottle – just make sure there is enough substance left inside the bottle to conduct this experiment. And if not, use another CuSO4 bottle to reach the needed amount. Why shouldn’t I leave any of the iodine-treated plastics on the table without protecting it? It’s better to use paper or the plastic tray to protect your work surface from iodine stains. Iodine diffusion into plastics is reversible, meaning that the iodine will leach out with time and stain your table. The beaker smells pretty strong. Is this safe? This is not dangerous, but it is better to conduct this experiment in a well-ventilated area. 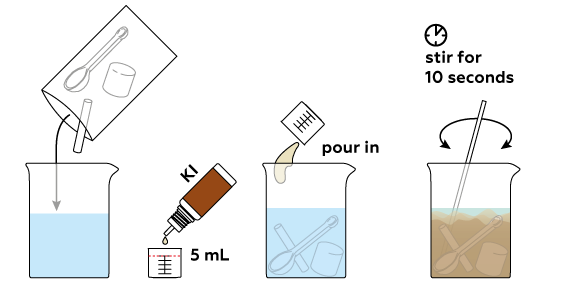 And don’t forget to use the cap after mixing all the reagents together! The plastic spoon did not turn pink. Is something wrong? Actually, this is one possible outcome of the experiment. Plastic composition differs slightly from one spoon to another even in a single batch. This difference can be enough to affect the resulting spoon color. Normally, the color of the spoon ranges from pale brown to pink. The plastic pieces faded by the next day. Is something wrong? Well, there is no way to keep iodine in plastics for an extended period of time. Iodine diffusion is a reversible process. With time, all three plastic samples will gradually fade. Copper sulfate CuSO4 is needed to produce iodine. 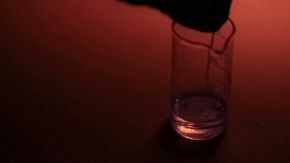 Potassium iodide KI reacts with CuSO4, forming iodine I2. Iodine, in turn, diffuses into the plastics. At the beginning there are many iodine molecules in the solution, and none inside the pieces of plastic. As time passes, iodine molecules penetrate deep into the plastic. This process is called Diffusion. Excess iodine can be turned back into iodide ions using Na2S2O5. When there are no iodine molecules left in the solution, you’ll see that some iodine has indeed entered the pieces of plastic. In this experiment, we produced some iodine. When pure, iodine forms dark-purple crystals which easily turn into purple vapor. The iodine we have, however, is dissolved in water and is more brownish than purple. In general, depending on its environment, iodine can have different colors, including shades of brown, purple, and even blue. Iodine is really good at penetrating into many materials. The plastics that we use are no exception. Iodine molecules easily pass in between the molecules of the plastics and thus stain the pieces all the way through. The plastics, in turn, provide unique environments for the iodine, just like air or water, and make the iodine brownish or pinkish in color. But what can make iodine blue? Potatoes! Stain a slice of raw potato with iodine and see for yourself. How does the iodine get inside the plastic samples? At first glance, our plastic samples don’t seem to have any crevices or cracks in their walls. They look and feel solid! Isn’t it strange that a substance can penetrate into these plastic walls from the outside? Sounds like some kind of magic, but it’s all science! Let’s imagine we have a very powerful microscope (from the Greek mikrós, meaning “small”) with which to observe a microcosm of common things. The microworld differs significantly from what we can usually see. As a matter of fact, there are many micropores in our plastics. Small molecules such as iodine I2 can infiltrate these tiny pores. There is plenty of free space inside the material where iodine molecules can stay for some time. The plastics provide unique environments for the iodine, just like air or water, and make the iodine brownish or pinkish in color. Processes like this infiltration of iodine molecules into plastics are called diffusion. Diffusion is a process wherein the molecules of one substance spread out among the molecules of another substance. In other words, the molecules of two substances mix together. Usually, this process is mutual. Through diffusion, molecules occupy all the available surrounding space. Ultimately, the concentration of particles (number of molecules per volume unit) becomes even in every area of the system. Here is an illustrative example from real life. Imagine peeling a fresh, juicy clementine somewhere indoors (in a classroom, for instance). Its smell spreads quickly across the room and the next thing you know, someone asks you to share your clementine. Guess what is responsible for this unexpected turn of events? Diffusion! 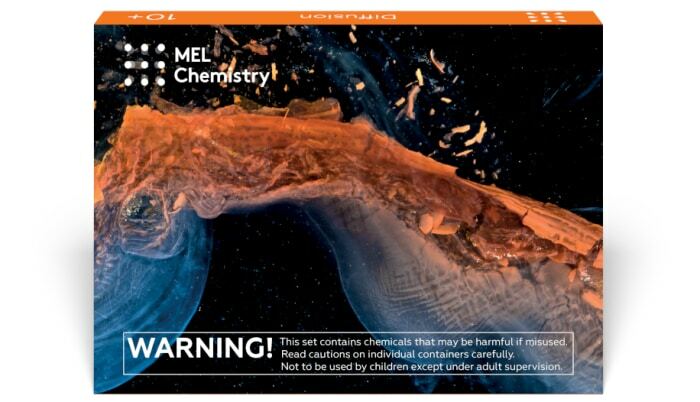 The volatile substances responsible for the clementine smell are released into the air. 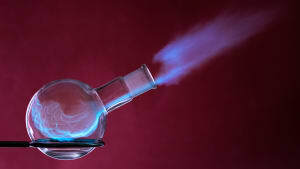 Initially, these molecules are all around you (providing the strong smell), but then they spread out to fill the room. On the one hand, the smell weakens since the concentration of molecules around you is lower. On the other hand, now everyone in the classroom can sense the smell. How did diffusion work in our experiment? Here, the process of diffusion is slightly more complicated. The iodine molecules from the aqueous solution move into the solid polymers (plastics), while the polymer molecules stay in place. Thus, it is a one-way process, with iodine as the only acting component. At the same time, the polymer structure is too rigid for iodine to spread all over the plastic. 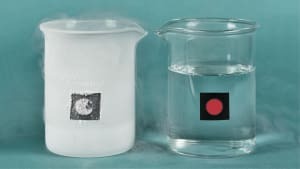 It would take a long time for iodine molecules to reach the voids deep inside the plastic – even with time, some of them cannot be reached at all. Plastic is a polymeric material such as polyethylene or polypropylene. Polymers have a complex three-dimensional (3D) structure; they consist of a huge number (up to several million!) of monomers – small and usually identical molecules connected to each other. Polymers are also called macromolecules (from the Greek makrós, meaning “long” or “big”). There are always some free spaces or hollows in the 3D structure of such molecules that iodine molecules can occupy. In nonpolar molecules, atoms do not compete for electrons. In other words, none of the atoms experience any lack or excess of electrons. As a result, nonpolar molecules bind to each other rather weakly. Conversely, polar molecules contain atoms with great differences in electronegativity, such as H and O in water H2O. The electrons in such molecules are distributed unequally. Consequently, polar molecules carry a positive charge at one end and a negative charge at the other. Naturally, the interactions between molecules in polar substances differ from those between nonpolar substances. Polar substances do not “like” nonpolar substances (and vice versa), so they do not dissolve in each other. For example, a nonpolar liquid such as oil cannot be dissolved in a polar liquid such as water. One essential rule of chemistry states that substances of a similar nature (polarity, for instance) "feel" comfortable mixing or dissolving in each other. Thus, the nonpolar iodine molecules do not “feel” quite comfortable in the polar water, but readily permeate the plastic through its micropores. 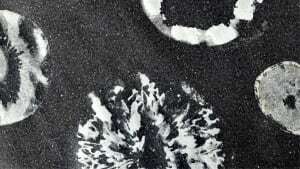 The same way as in the other experiment in this set, the «Iodine fingerprint» experiment. What is that pale orange precipitate in the beaker? 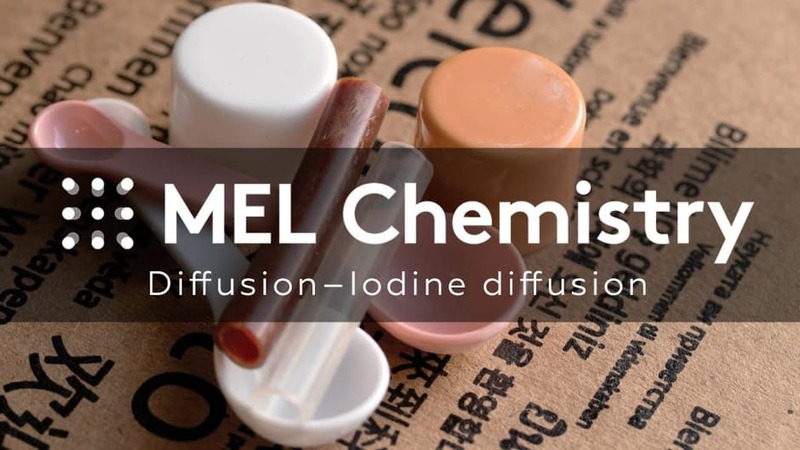 At the same time, a lot of copper(I) iodide forms when Cu+ ions meet iodide I– ions. This substance is not really soluble in water and precipitates. It is almost white by nature, but the iodine I2 in the solution tints it a pale orange, even brownish. Why does the iodine’s color differ among the different plastic samples? We are using three different pieces of plastic in our experiment – a polystyrene spoon, a polypropylene cap, and a silicone piece of tube. You can learn more about these materials in the «That’s interesting» section of this page. As these substances are substantially different in nature, they each interact differently with iodine. Why doesn’t disodium disulfite Na2S2O5 bleach the iodine inside the plastic? Why can’t the disulfite molecules penetrate into the plastic? Are these molecules too large? No, their size is actually comparable to iodine molecules. Hopefully, you remember that similar substances "like" each other. Since S2O52– ions are charged, they are highly polar. Water molecules are also polar, while plastic consists of almost nonpolar molecules. Therefore, both polar disulfite ions and water molecules "feel" very uncomfortable in plastic. Naturally, neither water nor disulfite can penetrate into the walls of the plastic tube – they’d have to expend energy to overcome the repulsion force keeping them out. Such a process would be energetically unfavorable! Polypropylene is the second-most-produced plastic for common use after polyethylene. It is often used for packaging and labeling. You can find the PP symbol on many food packages, like yogurts, chocolates, and many other. Methods of PP synthesis and usage were discovered in the 1950-s. Once polypropylene was found to be rather chemically stable, it found applications in a wide variety of laboratory plastic items from pipettes to test tubes. PP has a variety of applications, including packaging for consumer products, special devices like living hinges, and textiles. It actually has too many applications to list! Significantly, polypropylene is well recyclable, with the number “5” as its resin identification code. Polystyrene is one of the top-5 plastics in use nowadays. It can exist in two forms – solid or foamed. 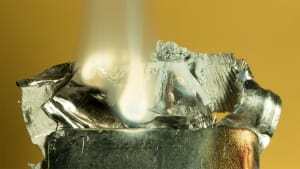 You are likely well-acquainted with its foamed form, as it is used in protective packaging for such items as household appliances or computers. Meanwhile, the solid form is utilized in some lids, bottles, and containers. It is usually marked as PS. Polystyrene is transparent (white when foamed) and relatively easy to melt – it liquefies at about 100oC. We have known of polystyrene for quite some time – it was discovered in 1839 in Germany and in 1931 was elevated to manufacture on an industrial scale. Nowadays, with the addition of some colorants, additives or other plastics, PS is used to make appliances, electronics, automobile parts, toys, gardening pots and equipment, and much more. Polystyrene, unfortunately, is not accepted as recyclable material in most recycling programmes, and there is a lot of polystyrene litter accumulating in the oceans. Its resin identification code is “6”. Silicones actually comprise a large group of polymers also known as polysiloxanes. A lot of cookware is made of silicones, so you have likely encountered a soup ladle or baking mold made of silicone. Silicones are inert compounds made of monomers consisting of repeating silicon and oxygen atoms (...-Si-O-Si-O-...), which are combined with carbon, hydrogen, and various other elements. Silicones are normally rubberlike and heat resistant and are often used in sealants, adhesives, medicine, cooking utensils, and many other contexts. Some of their common forms include silicone oil, silicone grease, and silicone rubber. Due to their large-scale applications, silicones are pervasive in indoor and outdoor environments. Some types of silicones are considered water and air pollutants. On the other hand, many other types biodegrade readily, so it seems that silicones made by responsible and qualified manufacturers can be considered eco-friendly synthetic materials.